Don't miss the opportunity to tour into Berlin, which has visibly flourished since the fall of the Wall in 1989. The Kaiser Wilhelm Memorial Church, Brandenburg Gate and "Checkpoint Charlie" are all here. In the Western sector, browse the lively Kurfurstendamm for snazzy clothing stores, delicate hand-painted porcelain and a snack of beer and bratwurst. 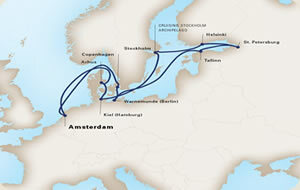 Sample shore excursions: Berlin & Potsdam; Rostock Revealed. Wander cobblestone alleys beneath turrets and red-tiled roofs in medieval Old Town. Relax near the swan pond in Kadriorg Park. Visit the impressive museum in Baroque Kadriorg Palace. Sample shore excursions: Tallinn's Old Town A Walking Tour; The Spirit of Medieval Estonia. Glorious history and art, fanciful palaces, a rich imperial past all here in the city founded by Peter the Great. Sample shore excursions: The Hermitage Museum at the Winter Palace; Pushkin: Catherine's Palace; Gala Evening at Yusupov Palace; Glories of St. Petersburg. One of Europe's most scenic capitals. Expect stylish and sophisticated shops on Esplanade Street. Explore the Rock Church, built entirely of stone. Sample shore excursion: Lapland, Arctic Circle & Santa Claus Tour. Founded as a fortress in the 13th century, Stockholm spans 14 islands and is considered one of the world's most beautiful capitals. Sample shore excursions: Waterways of Stockholm; Royal Palace & Old Town. Aarhus, Denmark is a friendly, compact city full of english speaking locals with all its main attractions located within walking distance of the cruise port.